Providing you the best range of High End Projector such as Hitachi High End Projector and Panasonic High End Projector with effective & timely delivery. 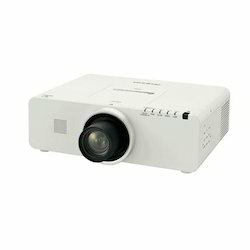 Our company is the leading company known for providing Panasonic High End Projector to the clients. This product is used by various clients in institutes, offices and conference halls. Offered range is manufactured under the stern vigilance of professionals of our vendors using quality approved material and pioneering technology at par with quality standards. The Panasonic PT-LS26 delivers 2,600 lumens of high brightness and 2,300:1 high contrast ratio, all in a compact, easy-to-carry body, weighing only 2.3 kg. Bright, clear images enhance a variety of viewing situations and applications. When Standby mode is set to Eco, the standby power consumption is low at 0.5 W. This lowers running costs, and helps to reduce environmental impact. The Auto Input Signal Search function automatically detects the input signal and selects the input channel based on the signal. This function lets you start a presentation without any complicated setup required.